Exciting! GOODNIGHT, ARK was named a 2015 Christian Book Award® Finalist. Upcoming! Sunday March 11, 2018 2:00 pm. BOOK LAUNCH PARTY! Celebrate a DIVA debut at this special story time and book signing with craft! Barnes and Noble, Rte. 22 Springfield. Upcoming! Wednesday, March 21, 2018 10:30 pm. Join me for an interactive story time featuring DIVA DELORES AND THE OPERA HOUSE MOUSE at the Garwood Public Library. Meet my storytelling companions – Delores and Fernando–and enjoy a book-themed craft. Upcoming! Friday, April 6, 2018 11:00 am. SPECIAL AUTHOR EVENT: Picture Book Creation with DIVA DELORES AND THE OPERA HOUSE MOUSE, Cranford Public Library, registration required. Ages 5 and up. Upcoming! Saturday, April 7, 2018 10:30 am. Join me for an interactive AUTHOR/ILLUSTRATOR Storytime with Laura Sassi. Watchung Booksellers, Montclair. Upcoming! Tuesday, April 17, 2018 4:00 pm. 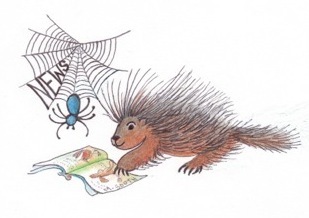 Participate in an interactive reading of DIVA DELORES THE OPERA HOUSE MOUSE, then create your own book-themed craft out of clay at the wonderful Fire Me Up Studio in Cranford! Signed copies will be available for purchase. Interview: Laura chats about GOODNIGHT, ARK with Darlene Beck Jacobsen. Interview:Laura shares her thoughts on writing, faith, and more at Vocational Mothering and Denette Fretz’s blog. Anchors away! In celebration of the release of GOODNIGHT, ARK Laura goes on her first ever blog tour! Click here for interviews and more. Interview: Spinning Tales in Prose and Rhyme. Thank you, Robin Newman! To Rhyme or Not to Rhyme? Laura weighed in on this tricky topic at Anne E. Johnson’s blog: Rhyming Stories as Shiny Shoes. Lights, camera, action! Laura was the featured poet of the week (includes video-reading and interview!) on Renee LaTulippe’s website, No Water River: POETRY MONDAY: “Sir Ned” by Laura Sassi.